Updated 11/16/18. Please note: this article may contain affiliate links. In cases such as these, it’s definitely a famine, not a feast. Your reptilian brain takes over and activates “survival mode”. As a result, you may look for opportunities to increase your freelance income by finding a source of high-volume article writing opportunities—regardless of the per article price. Even $10 for 1000 words seems agreeable when your fledgling business is not yet earning enough to get by. And where do starving writers go to find these opportunities? Those in the industry refer to them as “content mills”. 1. Content Mills Don’t Pay Writers a Living Wage. 3. The Content is Super Generic. 7. Content Mill Quality is Inconsistent. I have yet to encounter a content mill that specializes in a certain type of content (although I admit that it’s possible they exist, don’t @ me). They tend to be fairly generalist, accommodating many types of writers and many types of businesses in need of writers. You’ll recall earlier, I mentioned that one reason people take on low paying jobs is because they’re looking to build up their portfolio. Unfortunately for these freelancers, that’s not even an option when working with most content mills. Most content mills are selling ghostwriting services, which means that the end client can use their own byline associated with your work. It also means that the freelancer who wrote it can’t use it in their portfolio (there are exceptions but this is the rule when it comes to content mills). Though much of my distaste for content mills revolves around the ethical implications of devaluing writers’ hard work, there are also several business reasons not to use their services. I’ve already kind of talked around this but why not face it head-on? 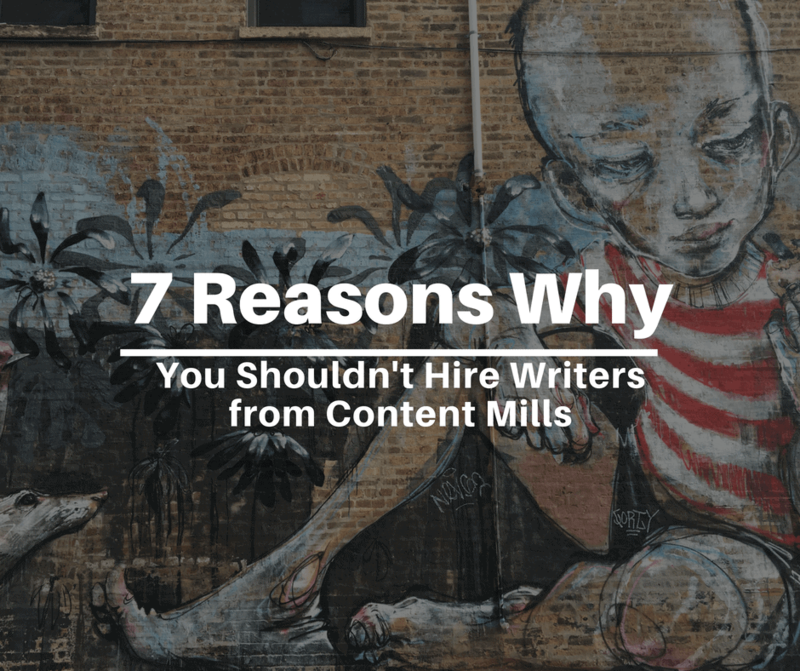 If you’re thinking of using a content mill, I challenge you to first consider the experience of more than a dozen writers who have worked with 15 different content mills. Most of these jobs offer less than $0.10/word—with many under $0.05/word. 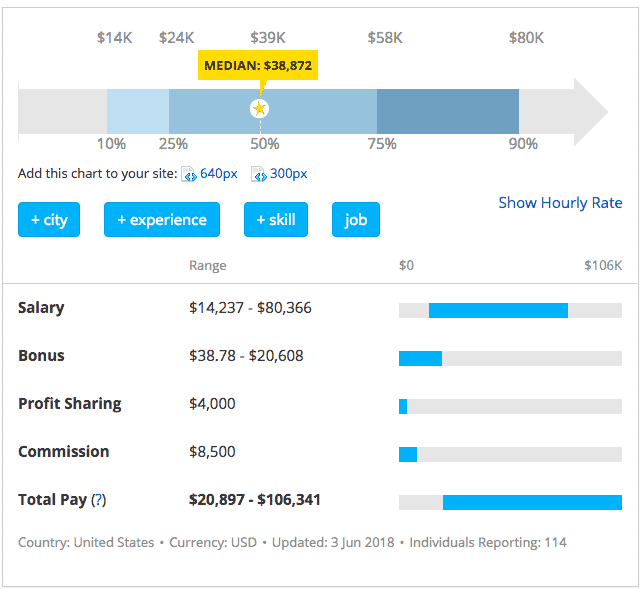 PayScale puts this into context when sharing a freelance writer’s yearly earnings: a median of just $38,872. Let’s not forget that anywhere from 20-30% of that goes to taxes!  One of today’s most popular content mills is BlogMutt. Their Writer FAQ states that pay starts at $0.035 – $0.045/word. BlogMutt’s levels system was hard to find information about in terms of advancement: I haven’t found anything covering writer levels in detail on the front-end of their website. Basically, you become eligible to write for increasingly higher-paying pieces of content. Side Hustle Inspiration mentions that the highest-paid level 7 assignments are few and far between. If freelance writing was like working on an assembly line, where each result required equal, predictable effort, this might be an agreeable situation. But no matter how technical the topic, writing involves a lot of creative effort. The more articles you have to spit out each day, the harder it is to get excited about what you’re doing. Each new article drains you at a rate that grows as you continuously add more on top of an already overflowing pile. By accepting low paying jobs, the resulting cycle you that becomes your life is a surefire path to burnout. Sure, you can come back from it by going cold-turkey, but there’s no guarantee you’ll still be able to enjoy writing. If there was a positive benefit associated with writing for content mills, it’s that the cheapest clients are the pickiest. This doesn’t mean they’ll be particularly enjoyable to work with but they will certainly be critical enough to help you to refine your craft (and fast!). Pro tip: The better you become at anticipating needs and asking questions up front, the more efficient your writing process will become. For any positive benefits content mills can provide, consider the psychological manipulation involved in attracting writers to their platforms. Content mills act as if their ability to send long-term work to freelancers makes them great but it’s important to understand that freelancers can’t make a living wage by offering discounts over the long-term. These ads should really be taken as “There’s no money to be made here and you shouldn’t expect there to be based on your own inexperience”. Speaking of which, content mills don’t run their businesses with a lot of margin up for grabs. During a recent quarter, a popular content mill, Demand Studios, made just $1 million in profit from $97 in revenue. The old school tactic for blog monetization involved a Google AdSense-like situation, earning money based on simple impressions. Since Google’s search algorithm has evolved, these generic articles can be considered low quality, with a negative impact on the ability to rank your website in relevant search. 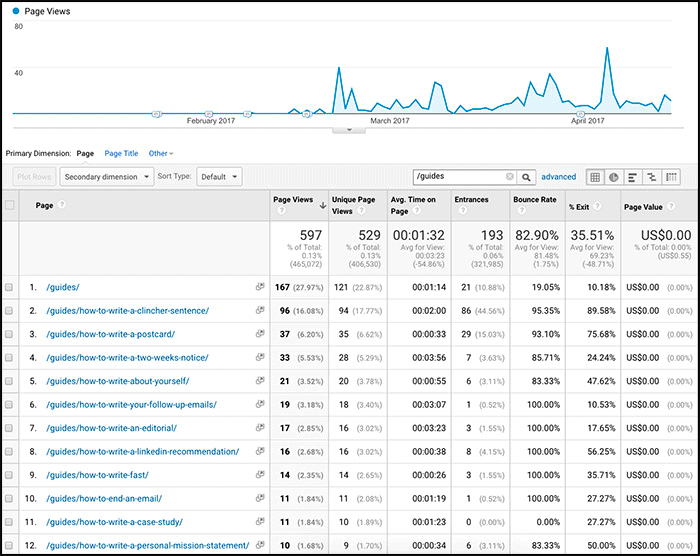 Even if Google doesn’t catch on, your readers will—and you’ll be able to see it happen when looking at user engagement metrics on Google Analytics. This state of the industry has driven down the demand and lowered the price for content mill content—without a change in fees paid to writers. They simply don’t have money available to increase rates: in many cases, a content mill is an underperformer in an investor’s portfolio of otherwise successful businesses. 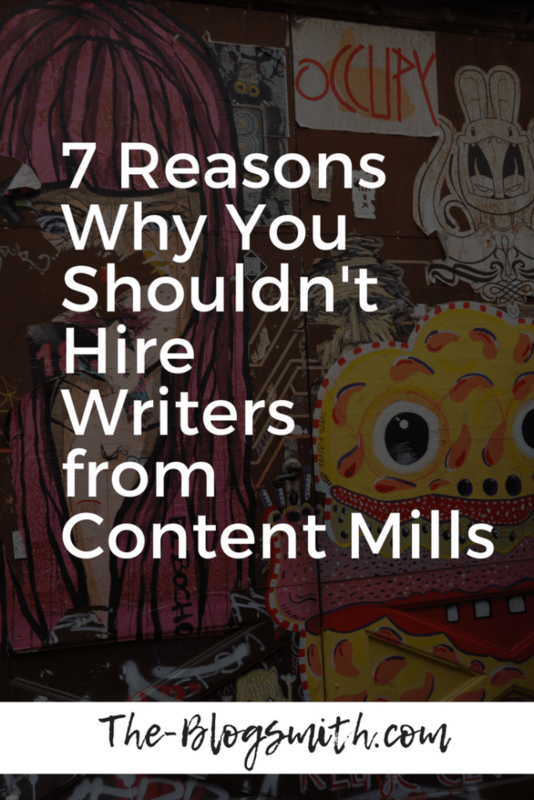 And since content created for content mills is technically considered ghostwriting, freelancers can’t use their work in their own portfolios. This also means that they can’t use work created for content mills to act as samples to apply for better, more high-paid opportunities. Either a prospect reaches out or I do: Regardless of how we met, the prospect gets the opportunity to learn about me before we connect by checking out my website (I link to it everywhere I’m active online) and by going through my relevant portfolio samples. Over a phone call or email, I take the time to learn more about the business in question, inviting questions, and making sure to detail my process for their understanding. We decide on one or multiple blog topics to get started with. I support the creation of relevant articles with keyword research. All clients are offered the opportunity to approve an outline before I write the full article. The completed article is sent for approval and up to two rounds of edits. Most clients don’t ask for revisions after we start consistently working together. When you work with a content mill, you might be able to see a profile and relevant samples from individual freelancers but there’s not much opportunity for back and forth before starting an initial assignment. Freelancers on these platforms either bid on assignments or accept available assignments based on their approval to write about certain subjects or at certain levels of perceived writing experience. Next, the order is placed and the freelancer gets to work on their best guess as to what a client is looking for. In many cases, the writer is expected to understand exactly what a client is looking for in a final article based on nothing more than a proposed article title. The other side of the issue is that content mills tend to favor the person paying over the person doing the work, which can cause for very frustrating resolution options if there’s any dispute over an order. A freelancer/client misunderstanding can result in public-facing negative feedback—hurting their ability to rise up in this system and possibly their ability to book future jobs. This lack of process also means that an already underpaid freelancer will also have to factor in the possibility for multiple revisions when calculating their total time spent on a given article (and their resulting ROI calculation). They also have to factor in the possibility that their article will be rejected with no payment. Even in the situations where a freelance writer does get paid, getting a bank deposit could still be weeks later after delivering an article—especially if editors take a lot of time approving content. In some cases, businesses may be able to work with the same freelancer over and over again to help reduce the need for edits but that’s not necessarily the standard when it comes to content mills. Content mills attract generalists, so if your industry is super technical, you’re SOL from the get-go. Let’s get real: general topic assignments result in work that sounds so… generic coming from the average content mill writer. In some cases, this is because you’re working with a complete n00b to the world of freelance writing. They’re probably only on this content mill platform to make some money and to refine their craft: your business is their lucky guinea pig. In other cases, it’s the burnout bleeding through. With little incentive to write anything truly great (or having to write about topics they personally consider boring), content mill writers constantly reuse phrases and structure articles similarly (regardless of the topic they’re writing about) in an effort to preserve their creative energy. A common symptom of freelance writing burnout is calling out the obvious in an effort to hit the required word count. Here’s the thing: in order for blog content to do anything for your business, it has to be written with a certain persona in mind. Writing content for content’s sake is something Google has proactively started to protect searchers from, so why even bother? Here’s another important note when it comes to commissioning generalists versus experts: pretending to be an expert can get you in trouble. There are also other concerns that come into play, such as whether lawyer blogs are considered as a form of publication or attorney advertising—the latter, of which, is highly regulated by states. I’m going to let you in a secret: the people behind content mills aren’t SEO experts. Want to know how I know this is true? First off, most content mills focus on churning out a volume of low quality, short form content. Though Google refuses to reveal their exact metrics for measuring content quality (at least in terms of content length), it’s more than fair to state that, in general, long form content will rank over similar short form content. Part of this has to do with the likelihood that long form content will have more opportunities to incorporate semantic keywords. Semantic keywords (related keywords) help Google make sense of topics and their relationships to other topics. Google Suggest offers ideas for the semantic keywords relating to your primary keyword. The other issue with content mills is that many businesses use them to create spammy content for black hat backlink building efforts. Though that may not be your intended purpose for commissioning content, the writers won’t necessarily know the difference when it comes to writing for you. When you can’t afford to pay writers a living wage, there’s no real motivation to do good work, so most freelance writers on these platforms just push themselves through the day to make it to their next paycheck. Besides a general lack of motivation, the comically low price per word offered by content mills means there’s really no time to do proper due diligence with regards to fact checking and self-editing. 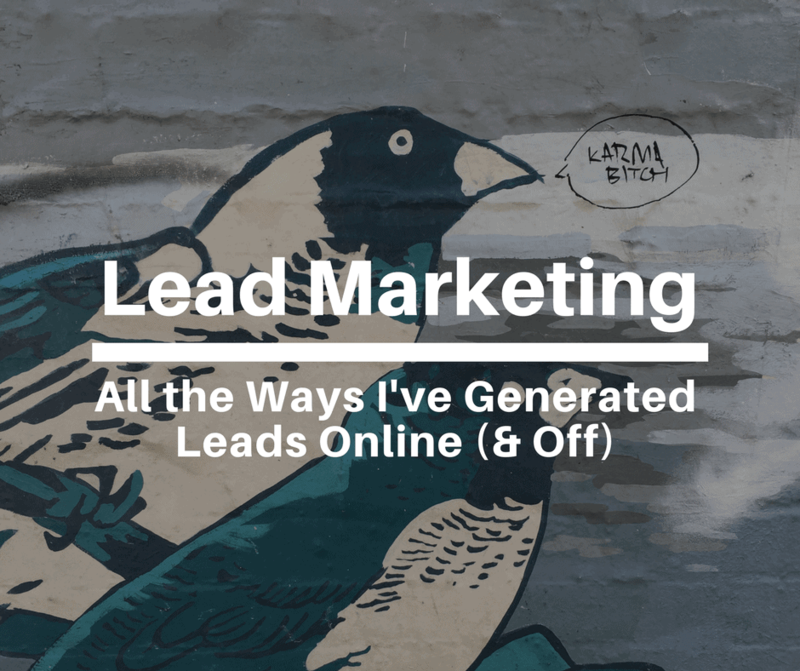 Basically, the idea for finding content mill “success” is to knock out as many articles you can per hour and cash in on your quick efficiency. To me, this sloppy work justifies paying another writer more to do it right the first time, which also reduces the time from commissioned article to publication. Another benefit to working with an expert who conducts themselves professionally? They can likely also help you with all the other important facets of blog content creation, like uploading the finished article to WordPress and optimizing for SEO and social sharing. Creating content for content’s sake is silly and a waste of everyone’s time: the person writing the content, the person buying the content, and the person reading the content. People don’t want to read articles that are genuine sh*t, so why bother spending your money on them? To be effective, there needs to be a strategy behind every piece of content that you commission and publish. And if you’re looking for some proof that speaks to the level of quality involved in churning out content under this model, consider how Neville Medhora conducted a content mill experiment and considered his investment in creating his own content mill a total waste. Content mills aren’t meant to make up your full freelance income but many introverted freelance writers get too nervous to execute proper business development, leaving themselves with few choices for making a living. Some writing platforms require writers to complete an application or (unpaid/time consuming) writing tests. Others don’t screen writers at all before they’re assigned their first job. When it comes to working with a content mill, the only thing you can really plan for is inconsistency. This is a major problem with the gig economy, where people (buyers and sellers) operate with the attitude that there’s no reason to bother with niceties or try to build a relationship. It’s just a gig, right? 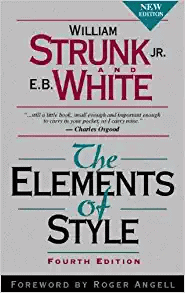 To try to remedy this situation, when I work with new contributors, I ask them to follow my writing style guide template. I don’t expect them to memorize it but it acts as a great reference point when people make the same mistakes—helping to reduce my time spent on edits over time. When working with different writers through a content mill, it makes less sense to justify explaining edits. Content mills can seem helpful to those getting started with content marketing, who don’t have a go-to writer. Reach out to your favorite authors on your favorite industry blogs. Not only will they be easier to work with: their reputations (and followings) can also help to bring additional/relevant traffic to your blog. My author profile onSearch Engine Journal. 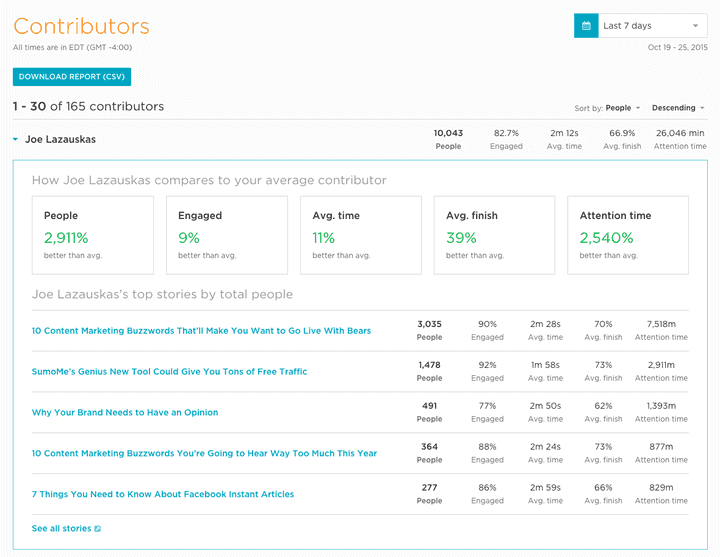 Ask for referrals from colleagues who manage blogs with awesome contributor content. Referrals make the world go round and involve built-in accountability. Hire writers from content writing platforms that value their freelancers. Some content writing platforms pay fair and even premium wages, while facilitating the management of your commissioned tasks. I can tell you about a few from experience. Fiverr gets a bad rap because of the perceived low-quality of services starting at $5 but the latest iteration presents reasonable opportunities for freelancers to make decent money. 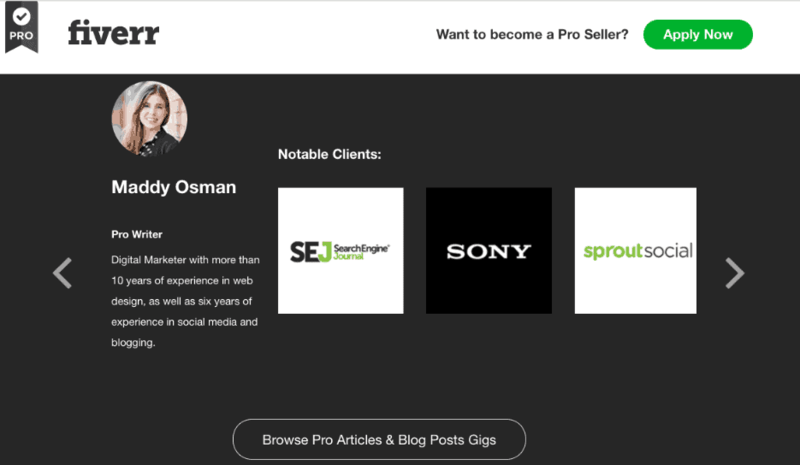 I share my own story of success with using Fiverr Pro to sell content writing services, on the Fiverr blog. After almost three years of aggressively building my portfolio and jumping on any and every opportunity for self-promotion (contributing to expert roundups, participating in podcast interviews, etc. ), I only just got my first offer on Skyword. You don’t apply for jobs—brands reach out to you. And you know what? It was totally worth the wait. 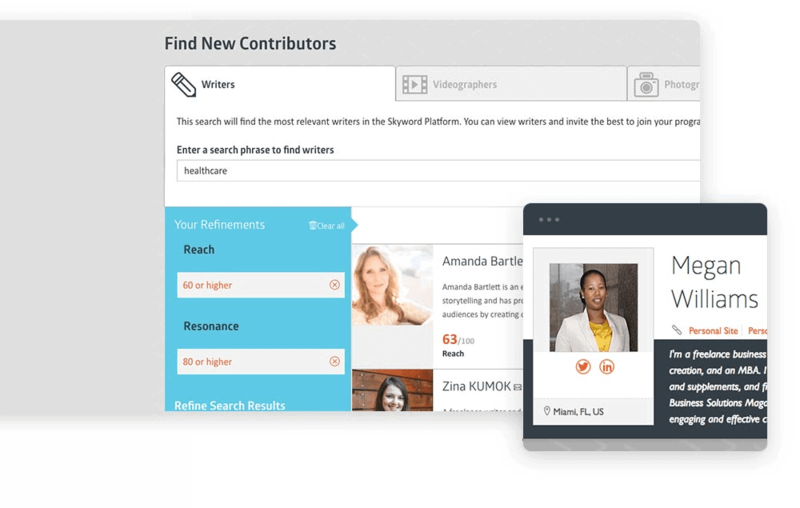 Contently is like Skyword in that you don’t necessarily apply for assignments—but you’ll want to complete a portfolio with your best samples on the platform in order to be considered by brands looking for freelance writers. If you don’t have a portfolio website, Contently can make for a decent solution in the meantime. 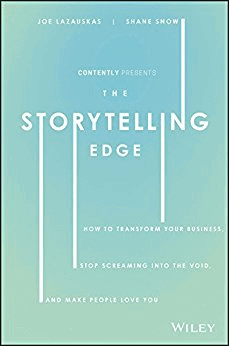 I’m eager to dig into The Storytelling Edge, a book by Joe Lazauskas, the Director of Content Strategy at Contently. 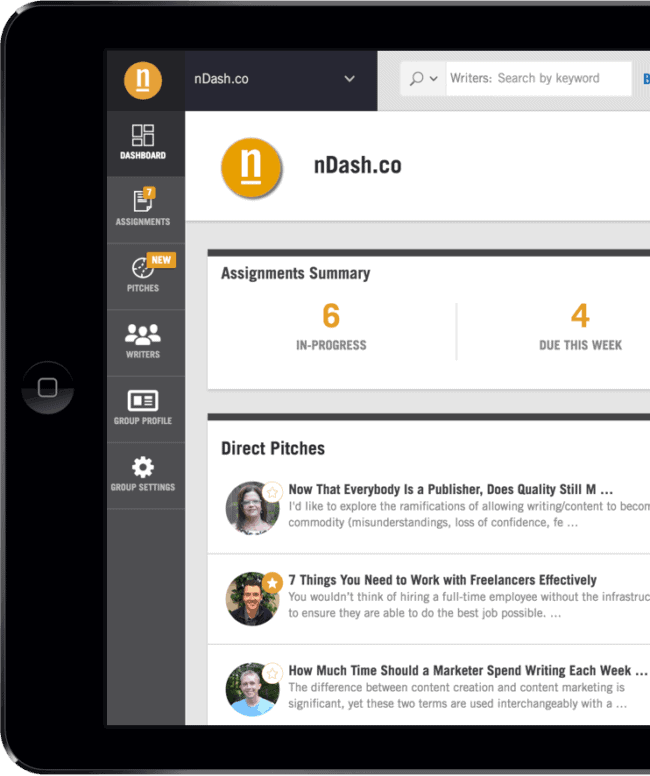 Full disclosure: I haven’t used nDash yet but I’ve got my eye on pitching LinkedIn Learning as soon as I think of a good enough pitch (or five). nDash connects writers with brands who are looking for quality content. You negotiate a rate with the companies you pitch and get to keep that full amount. nDash makes money with a freemium model that charges businesses based on a per-article commission and in terms of access to a range of features that help manage the whole content marketing process. Content mills pay writers abysmally low prices that can hardly be considered a living wage. Whether you’re particularly ethical in your business practices, or not, it’s easy to see how cutting out the middleman can mean having more money on the table to directly hire a professional writer with relevant industry experience. On that note, working with the same freelance writer outside of a content mill will be a better experience for both parties, if only because it involves a different type of motivation and a resulting feeling of satisfaction. Do you have any horror stories working with a content mill as a client or content writer? I love some good gossip—tweet me the best ones at @MaddyOsman on Twitter!